Bose SoundLink Micro Bluetooth speaker is small but its impact is huge. The speaker is compact in size, but it delivers amazing sound quality and great audio performance. The speaker is ultra-portable so it makes a great companion for traveling. Bose has some great sounding speaker and headphones series. Bose Sound Link Micro Bluetooth speaker will not disappoint you. The sound is balanced and it plays loudly in any setup. So, whether you play it along on a beach or your gym sessions, the sound will be the same. The best part about this cute speaker is that it’s waterproof. It is a great pick for your music for sure. Bose SoundLink Micro Bluetooth speaker is truly durable and well build. The only issue with this speaker is battery performance. If you compare it with other speakers in this range, then the battery performance is average. The playback time is 6 hours and it takes time for charging. This may not ideally suit your stereo or party needs. The speaker has soft rubberized finish that looks like one on SoundLink Color II which gives it a strong grip and environment protection. Its great for confined space or if you want to enjoy your playlist with your friends around. The bass base of the speaker is good but not that exceptional. Still, it’s a great buy for the price. There are a very few portable and compact speakers that deliver good audio performance. Bose SoundLink Micro Bluetooth speaker is ideal for your workouts or for that matter any outdoor activity. It will easily fit in your pocket or small sling. Its water resistant feature makes it safe to use in any setup. Is it for lounge parties? Well, you can use the speaker for your small house party. It’s not an ideal choice for big parties. You have better options for speakers if you want a setup or a party sound performance. This one is ideal for small get-together with family and friends. The speaker is also good for adventure activities like hiking and biking. You can carry the speaker in your backpack for a fun adventure musical ride. If you are a student, then this one is for you. It’s great for hanging out with your friends and dancing to the tunes you love. It’s also good for pure music listening. The sound quality of the speaker does not really suffer in high volume base. However, there can be a slight distortion if you play it loudly in a noisy setup. But, the speaker is truly adaptable for all your needs. There are many great features of the Bose SoundLink Micro Bluetooth speaker, let us look at some of them. Bose SoundLink Micro Bluetooth speaker delivers clear, crisp and great sound performance. It has a balanced sound and super unmatched bass base for a Bluetooth speaker of its size. It plays loud music in any setup be it on the beach or your small family gathering. It features water-resistant from the inside out (Ipx7 rating). With ultra-soft texture and rugged exterior, that resists dents and starches, it’s indeed durable and sturdy. The speaker is portable with a unique tear-resistant strap to carry along. You can simply strap it on your backpack or handlebars. You can also carry it along in your pocket as its compact in size. It comes in a hard case. Bose SoundLink Micro Bluetooth speaker gives you up to 6 hours of battery performance with Bluetooth pairing and rechargeable battery. The battery performance is average as compared to other speakers in this range. It has a wireless range of up to 30 feet so it is great for small spaces. The speaker has a built-in speakerphone for taking calls or your voice messages. It also lets you integrate with the phone’s Siri or your Google assistant. This saves a lot of time and there is no disturbance in the calls as well. It also features multi-functional buttons for accessing your voice prompts. Bose SoundLink Micro Bluetooth speaker is available in five different colors with contrasting straps. You can take your pick from the amazing choice of colors it offers. The speaker also features stereo and party mode so you can enjoy your music loud and clear. The speaker has super custom-designed transducer and silicone passive radiator. It helps to reproduce echo that is better than any speaker of its size is. This is the highlight of this good sounding compact speaker. The speaker connects to Bose connect app that lets you play your music through the app. You can also change your settings and stream online music with the help of the connect app. The app also lets you manage all the Bluetooth connections with a single swipe. The voice prompt feature helps to make the connections simple so you can always hear your music while traveling. Bose SoundLink Micro Bluetooth speaker is designed in such a way that you can carry it along with you, so it is perfect for outdoors. The interface is clean and it features strap so that you can tuck it around your bag or any other accessory. The look of the speaker is also stylish and it will not disappoint you. The build quality of the speaker is sturdy and amazing. The rubberized exterior provides complete protection from stains and it’s completely waterproof. Even if you drop the speaker, there won’t be a problem with the audio reproduction. It’s small in size but ergonomically it fits great. The speaker plays on its bass performance. In fact, it pushes the bass forward to an extent and emphasizes on the treble base. The best part is that you can hear every sound clearly in the audio. The drum and the other vocals are clear and that is why it’s the most popular choice for sound. The audio quality does not really suffer in low and mid-range. But, yes there can be a problem in the high range of the speaker. If you play it above the limit, then the audio can distort or break. So, it depends on your song or your genre. It is a great speaker but doesn’t offer the level of sound quality Bose’s larger, more expensive Bluetooth speakers like SoundLink Mini 2 have to offer. There is no 360-degree sound performance in the speaker and that is again a drawback of this speaker. Bose SoundLink Micro Bluetooth speaker is easy in setup and it integrates with almost all the devices via Bluetooth. The speaker features voice prompts that let you access your music on the go. Your task will become simple with the voice prompts. The buttons are neat and the overall interface is also clean. There are no added controls in the speaker and that makes this speaker handy. It features an added strap that you can attach along with your backpack. This is actually good for your traveling needs. The software is updated on integration. There are so many compact and portable speakers available but Bose SoundLink Micro Bluetooth speaker truly stands out in performance. The sound quality is actually great and there is no disturbance in the sound. The audio is clear even if you play it loud. Being waterproof, this gives you total freedom to take it along with you even it rains. On the higher level, the audio can crack but this also depends on your use. The speaker is compatible with almost all the Bluetooth devices. In fact, you can use it along with voice prompts to enjoy your music on the go. 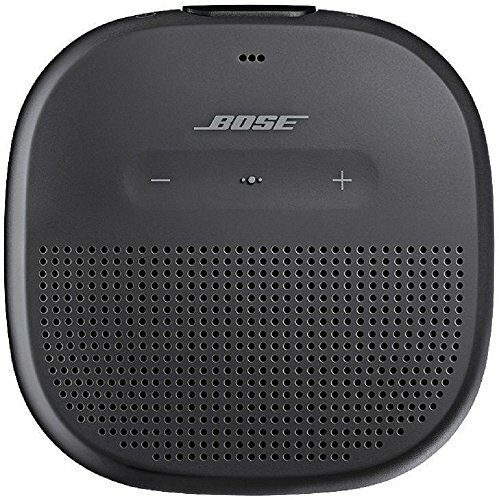 Bose SoundLink Micro Bluetooth speaker does not have any issue with connectivity. It connects to two devices at a time to give you loud and clear music. It also connects to Bose connect app so that you can change your settings and playlist through the application. It integrates with Siri and Google now to give you an amazing experience. The battery life of the speaker is average. It does suffer in the battery if you compare it with other compact speakers. On a full charge, you just get 6 hours of battery. This is a major drawback of this speaker. You can charge it along with the USB charger to enjoy your music uninterrupted. The rugged exteriors and good. The sound performance is great. It can be paired with second soundlink stereo. It has a strap for traveling. The battery life is not good. It can crack in the higher range. It has a monophonic sound at times. Bose SoundLink Micro Bluetooth speaker does what it really says. It delivers a great audio performance and the Bluetooth connectivity of the speaker is also good. It has a rugged exterior body so you can carry it along with you on your biking or adventure trips. It’s an ideal speaker for small gatherings. There is no such distortion on loud volume. SoundLink Micro Bluetooth Speaker only fall little short from its arch rival rival UE Wonderboom due to minor issues and price cut. Another drawback is its battery life. Six hours of battery backup is not good news for the price it offers. In fact, you need to charge the battery most of the times for listening to your music. Still, for a good audio base and highly portable device, this one makes a good buy.